For the last years Qualcomm Snapdragon platforms have been an important part of most high-end smartphones and tablets out there, but as of late 2017 Qualcomm and Microsoft unveiled the first Windows 10 commercial products built on Snapdragon hardware. I’m not going to get in depth on why this is a big deal, but I will mention what these Qualcomm/Windows devices are supposed to offer over the regular Intel/AMD built options that have been available till now: snappy and efficient everyday performance in cooler/smaller packages, always-connected features, longer battery life and integrated cellular connectivity out of the box. 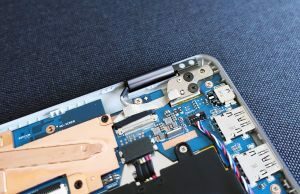 You should also keep in mind that these Qualcomm systems are not high-performance computers, but aim to offer a viable option for the average consumer that needs a highly portable device that’s always connected to the Internet. 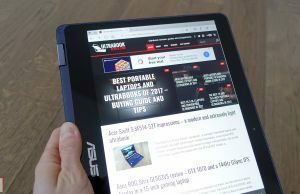 In the last weeks we’ve spent time with an early version of the Asus NovaGo TP370QL and gathered our impressions below. This is a very early implementation, months before its actual release, so you should take our findings with a lump of salt. Either way, the article below will tell you how the Windows 10 experience feels on a Snapdragon platform and what quirks you should expect if you’re planning on getting one of these at some point in 2018. 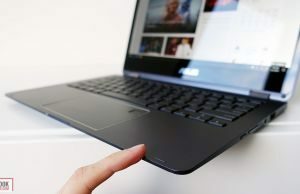 Asus will offer the NovaGo in a few different configurations, with 4 to 8 GB of RAM and 64 to 256 GB of storage. We got this entry-level option for our test, with a supposed retail price of $599. A higher end version with 8 GB of RAM and 256 GB of storage will be available for $799, but we don’t know exactly when these will actually be available in stores (I’d expect late-Q1 2018). 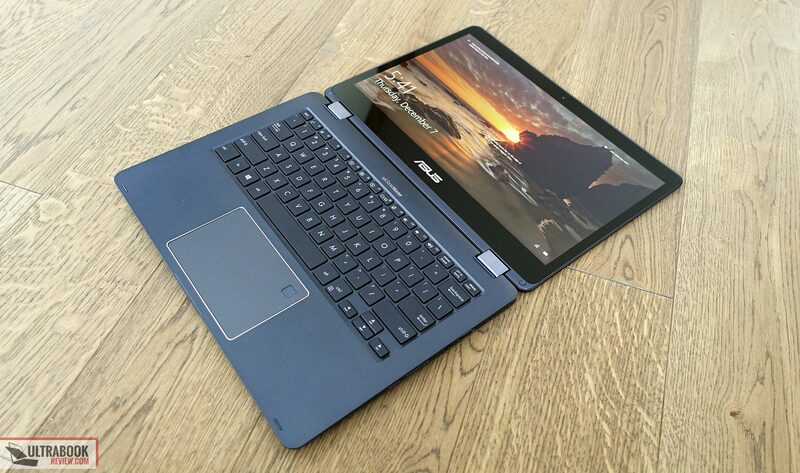 The NovaGo TP370QL feels and looks much like one of the Asus VivoBook Flip models based on Intel hardware. 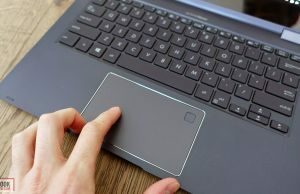 In other words, it’s a standard 2-in-1 laptop with a 360-degrees convertible touchscreen, ports on the sides, a full-size keyboard and the hardware tucked beneath it. 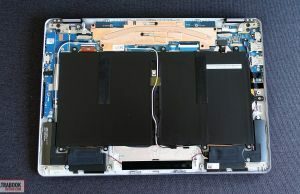 The real goodies hide beneath the shell, but before we get to talk about those let me share a few things about this laptop’s build, keyboard and screen. The construction is pretty good, with a metallic lid-cover and a plastic main body. 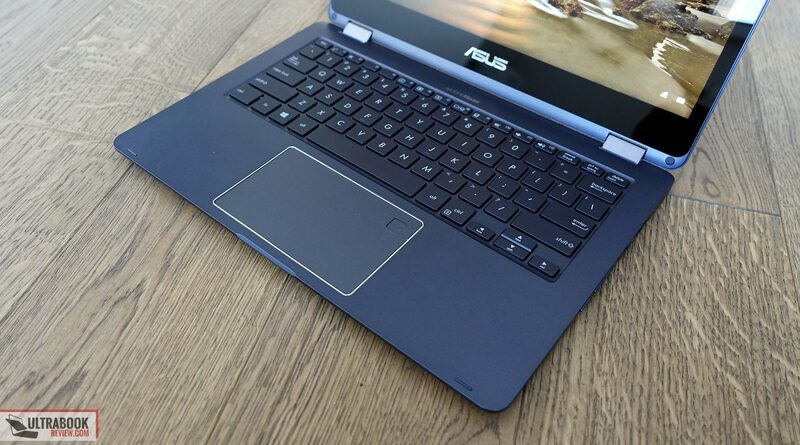 There’s some noticeable flex in the lid and the keyboard’s deck though. 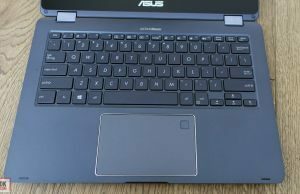 The former actually causes ripples on the panel when pushed firmer, so I’d be careful when carrying this laptop in my bag, while the latter is noticeable with everyday typing. All in all though, the build quality is not bad for the mid segment, but there are sturdier made computers in the same price-range. There’s not much to complain about the aesthetics though. 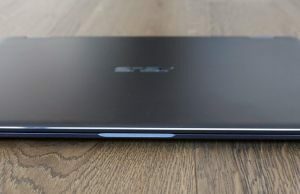 The NovaGo TP370 gets a dark-grey color scheme (Sky Grey, according to Asus) with a few chromed accents here and there: the beveled edge around the lid-cover, the Asus logo on the hood and the plastic frame around the trackpad. All in all the design is clean and simple, and I’d reckon will appeal to most people. 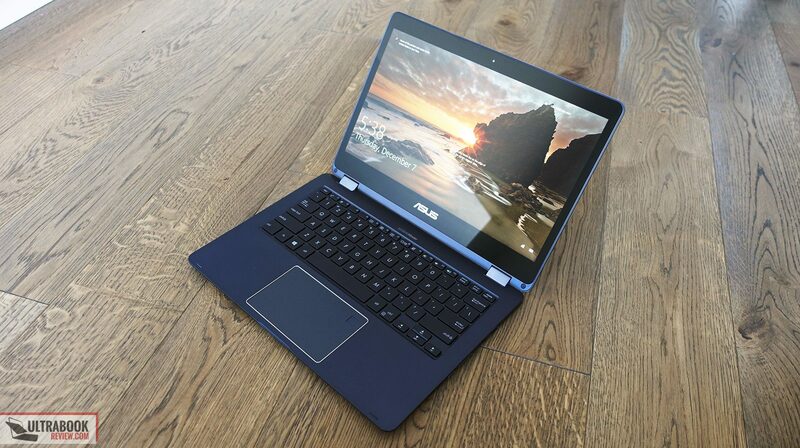 This laptop is fairly compact and light, yet not as compact or as light as some of the other hybrids out there. At 3 lbs and .6″ in thickness it should be a fairly good travel companion, but I’d expect well see tinier implementation of the Snapdragon platform down the road. 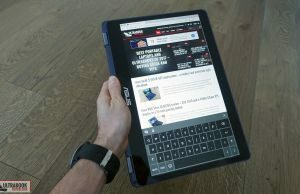 The bezels around the screen are fairly small on the sides, but pretty hefty on the top and bottom, which somewhat make this cumbersome to use in tablet mode. They shouldn’t be an issue if you plan to use the NovaGo mostly as a laptop though. 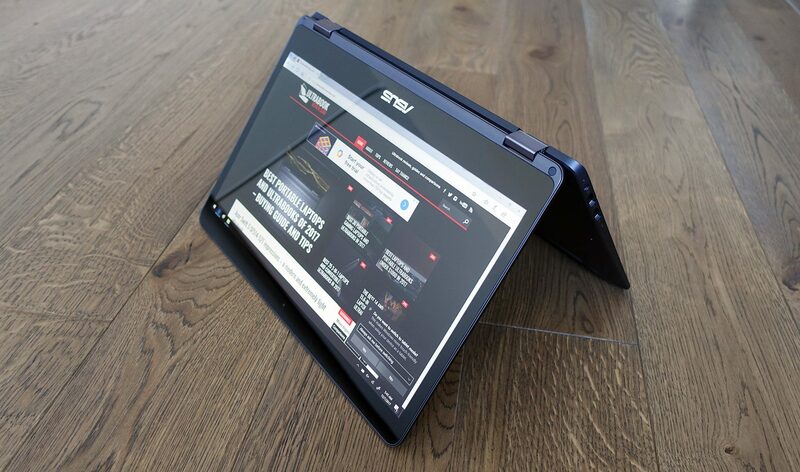 As far as practicality goes, this NovaGo Tp370 shares its strong points and small quirks with the other Asus 2-in-1s. 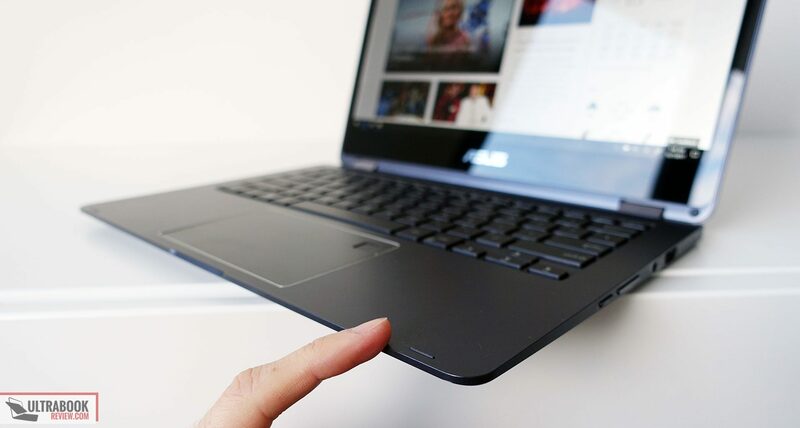 That means it sits firmly on the desk thanks to the grippy feet on the bottom, but you’ll need both hands to open the screen and the edge around the interior is rather sharp, but it shouldn’t bother you with daily use due to the device’s thin profile. The underbelly gets a very simple design, with just the rubber feet and the speaker cuts on the front. There are no air intake/output grills, as the platform is passively cooled. One final aspect to mention here is the IO. 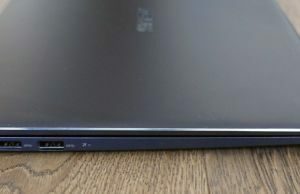 There are two USB-A slots on this computer and full-size HDMI for video, as well as a headphone jack and some status lights, all placed on the left and right edges. The novelty is however the small tray on the left side that takes a microSD card and a nanoSIM, for that LTE connectivity. 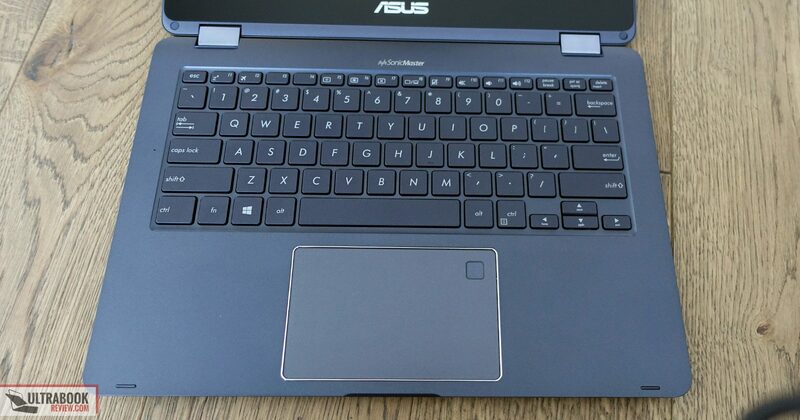 The keyboard and trackpad are once more similar to what we’ve seen on many other Asus laptops. 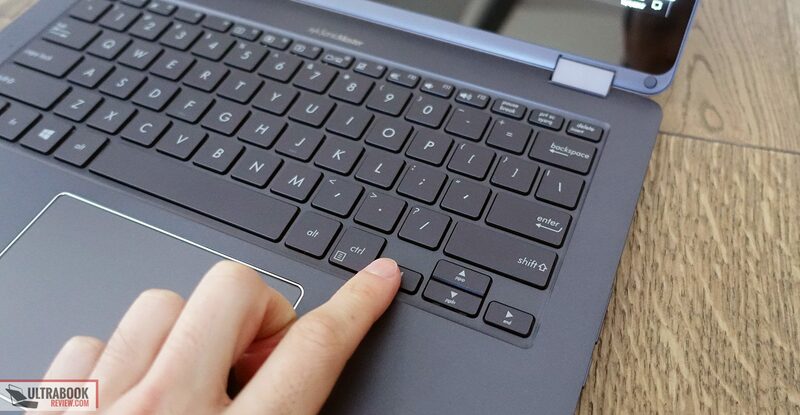 The keyboard gets a standard layout with proper sized keys and well spaced arrows. It types well, but they do feel somewhat shallow and spongy, so you’ll need some time to get used to the feedback. 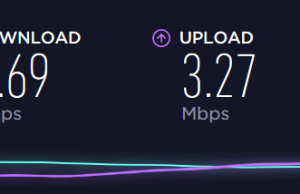 Average users will probably find this good enough for everyday use though, but it’s important to mention that there’s no backlightning, which is hard to accept in $600+ ultraportable these days. 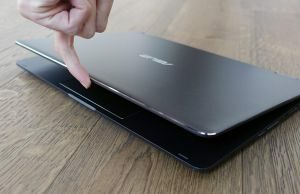 As far as the trackpad goes, it’s spacious and slightly indented into the frame. It gets a smooth glass surface and Precision drivers, so it feels nice to the touch and it performs well with swipes, taps, gestures, you name it. The physical clicks are stiff though, at least on this early sample. 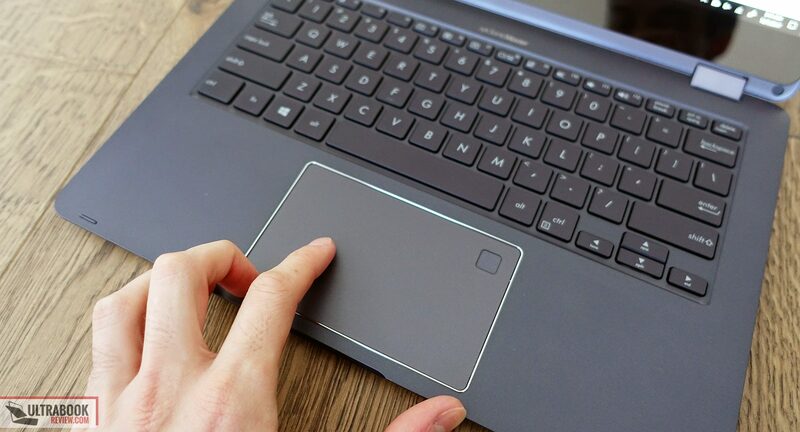 A fingerprint sensor is integrated in the clickpad’s top right corner. 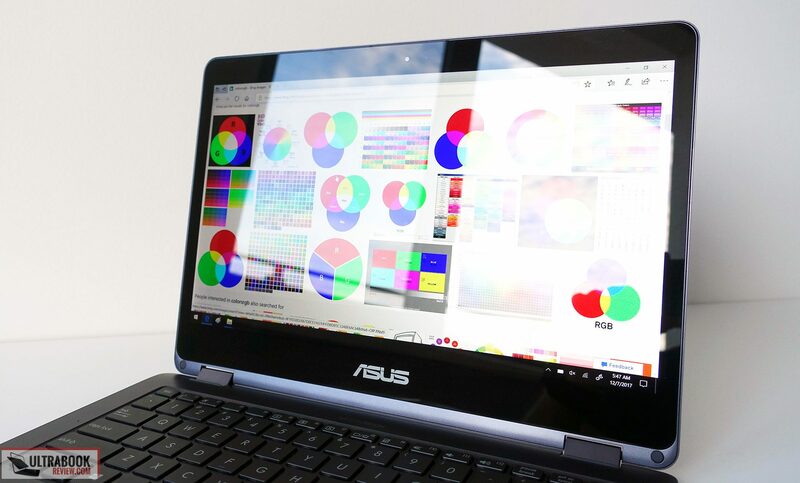 For the screen Asus went with a 13.3-inch IPS panel with 100% sRGB/ 70% NTSC color coverage. 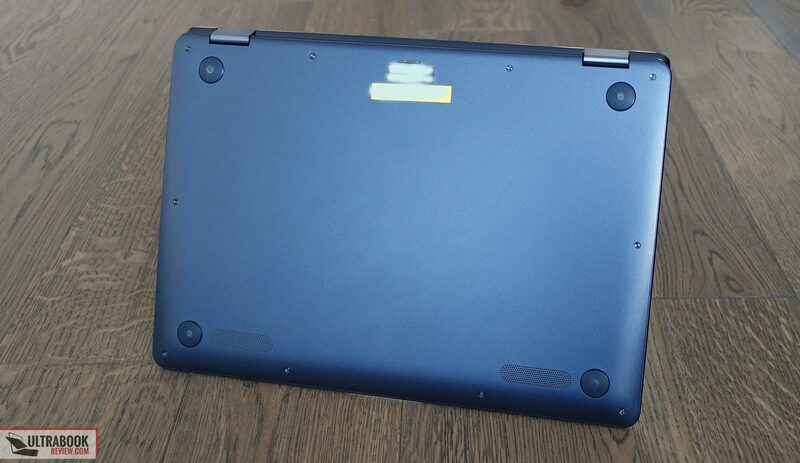 Unfortunately our Spyder did not work on this laptop (more about that in the next section), so I can’t share specific details on brightness, contrast, gamma and color accuracy, but as far as I can tell the AU Optronics B133HAN05.3 (AUO532D) panel that Asus went for is about what you should expect from a mid-range notebook: roughly 250 nits brightness and 700:1 contrast, with good viewing angles, decent colors and no noticeable light bleeding. That means you’ll struggle to use it in bright environments, especially since this is a touchscreen and the glass on top adds a fair amount of glare, but should do fine indoors. 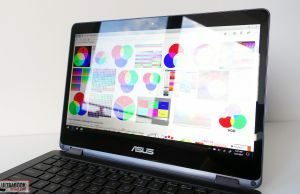 The screen includes support for Asus’s Active Stylus Pen, but the Pen is sold separately and was not included with out sample, so I can’t tell you much about it. 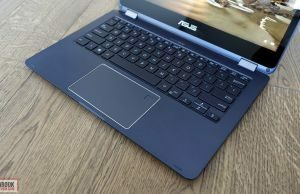 I’d expect the experience to be similar to the one offered by the existing Asus VivoBook and Zenbook Flips that support the same stylus. OK, let’s get to the elephant in the room. Out of the box the NovaGo came with Windows 10 S, the basic version of Microsoft OS that limits users to installing only applications from the Store and using the default Edge browser, but with enhanced security and performance, at least according to Microsoft. You’ll find plenty about Windows 10 S online, all I can say is that I upgraded to Windows 10 Pro (free upgrade) as soon as I got the laptop, in order to be able to install and run all the things that I normally put on a Windows computer. There are a few reasons why you might not want to do that, though. First of all, if you get this basic configuration with 4 GB of RAM and 64 GB of storage (all soldered and non-upgradeable), Windows 10 Pro is going to only leave you with about 32 GB of free space on the drive (less over time) and about 2 GB of RAM available for everyday use. On top of that, even if I could install most apps on this computer, some of them did not launch. 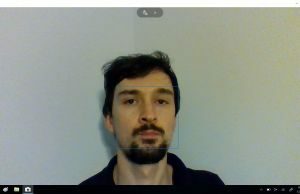 I could use Chrome and my favorite video player and so on, but some programs will not work, at least for now, and that’s because they’re not all compatible with the ARM architecture. This clip sheds light on the ARM processors (the Snapdragon we have here) and how they differ from the x86 processors (Intel, AMD), in case you’re curious. Of course, app compatibility is going to improve over time, and don’t forget we got to play with a very early version of this laptop, months before it was scheduled for retail release. 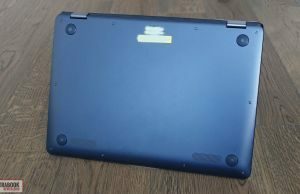 Normally these Snapdragon laptops should be able to run most Windows 32bit compatible applications, as Microsoft has developed an emulator that allows these x86 applications to run on an ARM platform. 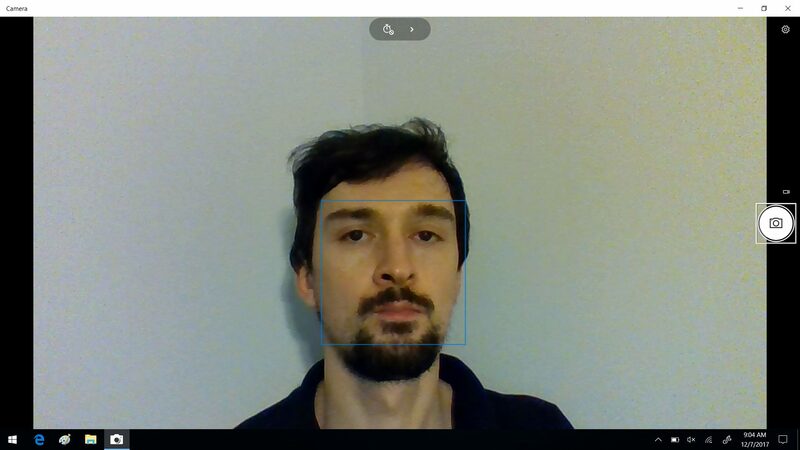 So far though, not everything is compatible, at least on this early sample. Things like Office, Photoshop or even some older games worked fine on my sample, although performance with these games was limited. As far as we know right now, Microsoft compiled the Windows 10 core systems to run natively on ARM, not through emulation, and third-party applications could also be recompiled for ARM, which should translate in improved performance and efficiency when (if) this happens. 64-bit Windows programs aren’t supported yet, nor are applications that use kernel mode drivers. 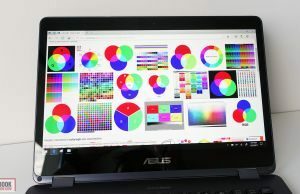 If you don’t plan to upgrade away from Windows 10 S, you can think about this computer as an alternative to Chromebooks, which work in the same way: most of the activities are browser and Internet based, and you can only install apps from a store. 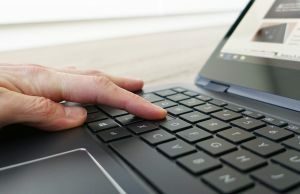 However, there are a lot more apps available for Chromebooks (at this point, and I don’t think that’s going to change much in the future), Chrome is arguably a more complete browser than Edge, and Chromebooks are usually affordable, while a Snapdragon 835 notebook won’t sell for $300 or less. Of course, a Snapdragon 835 laptop is going to perform better than a Celeron/Pentium based Chromebook, and not just on paper. 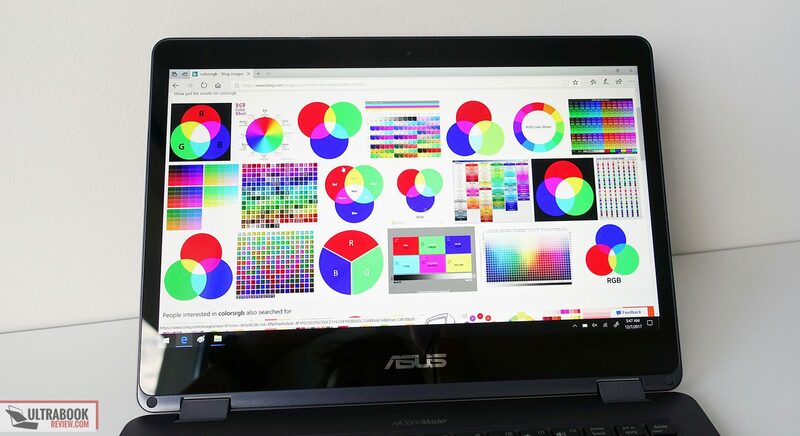 In practice this Asus NovaGo feels snappy and fast, even with 15+ Tabs open in Chrome, some music playing the background and some Word documents. The processor is fully capable of supporting everyday loads, yet you’ll notice some sluggishness with multitasking, and the bottleneck is probably the amount of RAM. 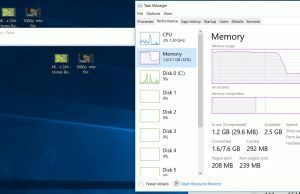 Chrome is a memory-hog as we all know and 4 GB of RAM are hardly enough on a Windows computer these days, that’s why you’ll probably want to go for the higher end configuration with 8 GB of RAM and more storage space. At this point you’re however biting into the higher-tier of Core U premium laptops though, and a Snapdragon option with limited app compatibility might not make that much sense in this $800+ price range. 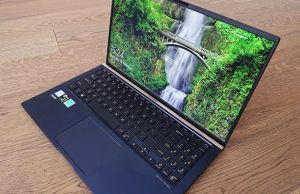 Back to performance, I’ve also added a few benchmarks below, but don’t forget our sample is pre-production, with early drivers and running on Windows 10 Pro, so results can much improve by the time these Qualcomm laptops will be available for retail. CineBench R11.5 32-bit: CPU 1.50 cb, CPU Single Core 0.50 cb. As far as CineBench performance goes on this unit, I ran the test for several times in a loop and got results within 1.48 and 1.50 pts, with the CPU running at only around 2.00 GHz in the multi-core test, and around 2.5 GHz for the single-core benchmark, as you can see in the pic below. These numbers fall behind even an Intel Core m3, but as I mentioned earlier, these benchmarks are probably not optimized for the ARM platform and thus the results should be taken with a grain of salt and not directly compared to those of standard x86 platforms. 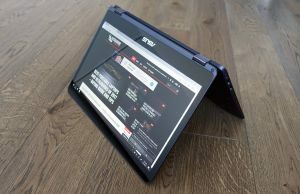 As far as noise and temperatures go, given this kind of hardware is normally used on smartphones and tablets, there should be no surprise the Asus NovaGo is one of the coolest running notebooks we’ve seen lately. It’s also completely silent, as it’s passively cooled and I also didn’t notice any traces of coil whining or electronic noise. One of the biggest selling points for these Snapdragon powered computers are the integrated cellular connectivity and always-on features. 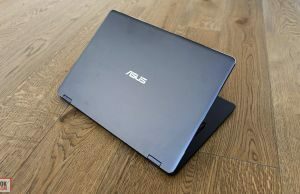 Regular laptops can get into sleep mode, but those that are always-on capable will wake up from time to time while they appear to be closed, in order to sync your apps with the cloud (mail, social media, etc). Think about your phone, which is able to sync your messages and data while in stand-by, and can still be efficient and offer days of stand-by time on a charge. With Snapdragon laptops you’ll get the same experience, but longer stand-by times because they get bigger batteries inside. Always-on features are made possible by the integration of the Qualcomm Snapdragon X16 LTE modem inside the Asus NovaGo, one of the fastest solutions out there, capable of transfer speeds of up to 1 Gbps. The implementation comes with a 4×4 MIMO antennae system, so signal strength and performance should be top-notch (as much as allowed by the cellular network in your area, of course). 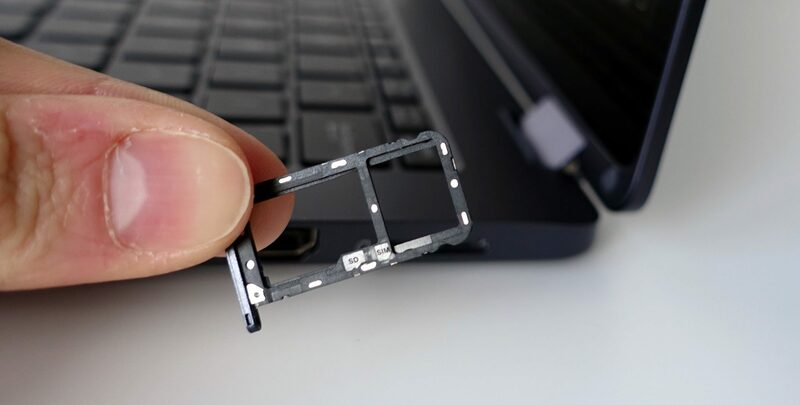 The laptop comes with a SIM tray, but there’s also support for eSIM, a technology that allows to switch between carriers when needed without having to actually swap out physical SIM cards. The notebook also gets Bluetooth and Wireless AC (with 2×2 MIMO antennae), which performs well near the router but is pretty much unusable at 30 feet with 1 wall in between on 5 GHz. 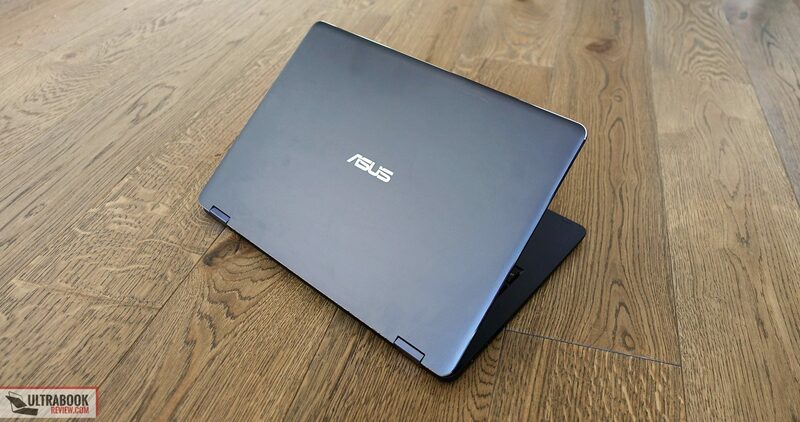 There’s a 52 Wh battery inside the Asus NovaGo TP370 and efficiency is one of the platform’s biggest selling points. 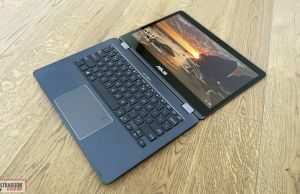 Asus advertises up to 22 hours of battery life (twice of what an Intel Core U laptop offers) and up to 30 days of always-on standby times. 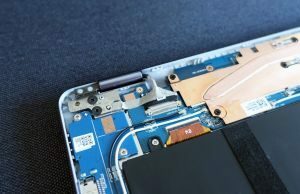 Unfortunately HWinfo and other apps that measure battery dischargement didn’t work on our sample, so I can only offer you some estimates on battery life. From my tests, I’m expecting around 12 hours of Youtube, around 15 hours of looping a 1080p mkv file and about 7-8 hours of everyday multitasking from this computer (with the screen at around 120 nits), which is indeed a significant step-up from the available Intel based ultraportables with similar sized batteries. Stand-by use on the other hand didn’t work as advertised on our unit, which for some reason did not enter that-efficient sleep mode, so I can’t share any data on this topic. another with 8 GB of RAM and 256 GB of SSD storage, for $799. There’s no word on availability, but we do know that other Snapdragon notebooks are scheduled for late Q1 2018, so I’d reckon the NovaGo won’t come earlier. We’ll update this section once we know more. All in all I’m hyped about the potential of Snapdragon laptops running Windows 10. 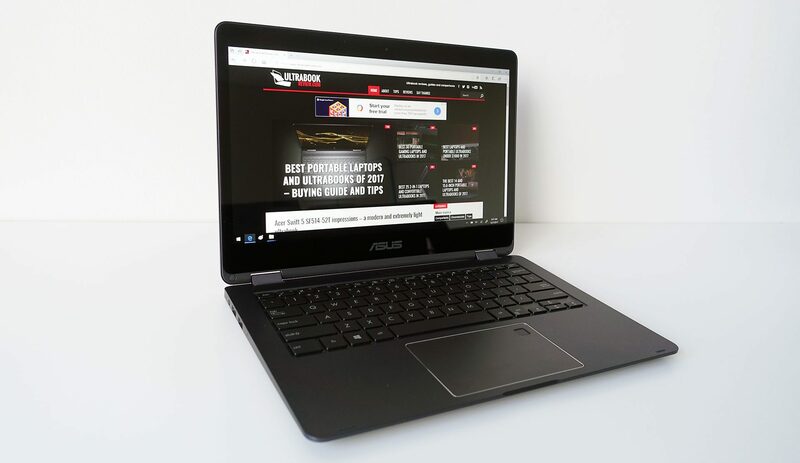 Yes, there’s a lot of room for improvement when it comes to app compatibility and performance, but even so, this early sample of the Asus NovaGo shows there’s plenty to like in here. 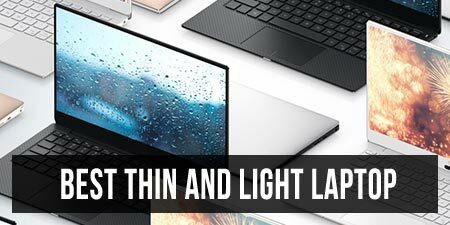 With these Snapdragon builds, OEMs are able to create much thinner designs that run cooler than their Intel/AMD counterparts, but also more efficient. 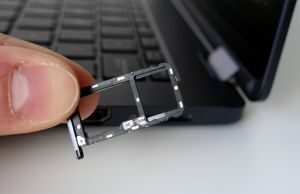 That aside, these devices get always-on connectivity and integrated LTE modules, something you normally only get with very expensive business laptops. 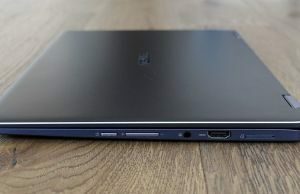 As far as performance goes, yes, a lot depends on how well Microsoft manages to emulate x86 software on this ARM platform and in general, Snapdragon laptops are only meant for everyday chores and casual multitasking, but most people don’t ask more from their laptops anyway, so performance wise I’d reckon these will appeal to many potential buyers. Back to the Asus NovaGo TP370QL, this is one of the first Snapdragon-Windows 10 implementations. At $800 for the configuration with 8 GB of RAM and 256 GB of storage it’s on par with a fair amount of laptops built on Intel Core i5 platforms, but I’d expect it will get cheaper down the line. 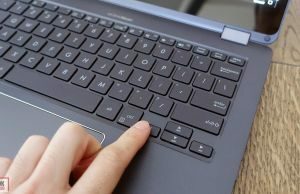 It’s expensive and one might even say limited as a Windows 10 S computer and an alternative to Chromebooks, but once you upgrade it to Windows 10 Pro it makes more sense, and it will be an even better solution as app compatibility improves down the line. 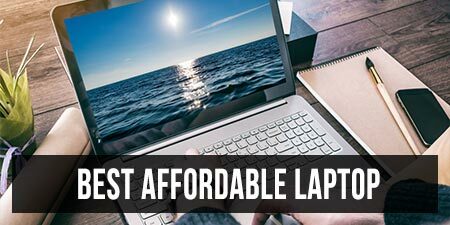 At the end of the day, this NovaGo is a computer for everyday use and a computer for those among you that value battery life, portability and a constant connection to the Internet over performance in demanding loads. It’s hard to say whether it’s a good buy or not based on my experience with this early sample, and I’ll refrain from any conclusions until I actually get to spend time with some more mature versions of this Snapdragon/Windows implementation. 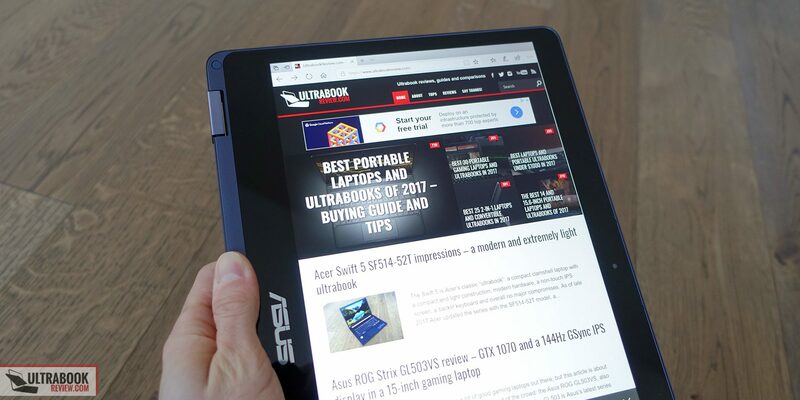 What I can definitely say is that this is worth keeping an eye on in the first half of 2018 and next year should be quite interesting for those interested in ultraportable laptops. Finally. I've been waiting for snapdragon devices. This is the first review I've seen. I'm a developer and sometimes use Visual Studio. I really would like to know if that work. 8 GB ram is OK. CPU should be ok as well, but the rest is up to emulation I guess. 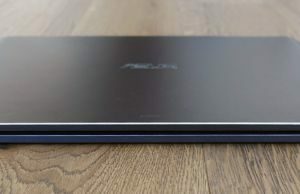 Right now I feel this laptop could be a good alternative to Asus 360ca, but overall I think snapdragon will be at its best in super light 10-12" devices. If you didn't send it back, and if you feel geeky enough, why not put the ARM version of Debian on it and see how it works? This would give you tens of thousands of native-compiled programs, therefore with much better performance than when going through a JIT translator. Sry, I sent it back and I don't think they would have allowed me to put Linux on it anyway. Would love to ser a dual boot with Android on my s8. Hardware i know we have. Very informative review! 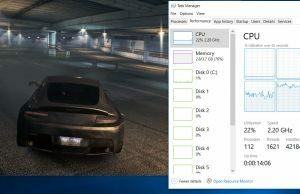 I can't belive how well the battery lasts, but what it seems more amazing is that the snapdragon 835 can run nfs 2012. At first I thought that it is the 2005 version…but no! How well does that game run exactly? I suppose you tested it on lowest settings~600p. 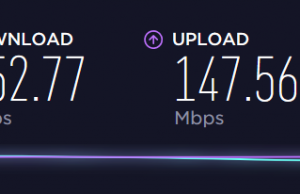 And how do 1080p videos run? Or even 1440p and 4K? 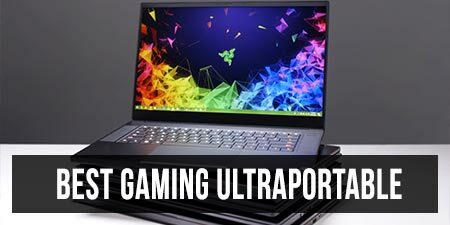 Performance wasn't great with games, but keep in mind this unit is pre-release and a lot can change by the end of Q3 when this laptop is supposed to retail. 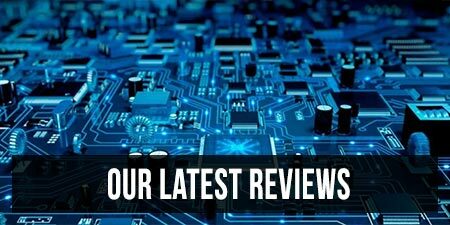 Do you plan to revisit your review once the final version of the laptop becomes commercially available? 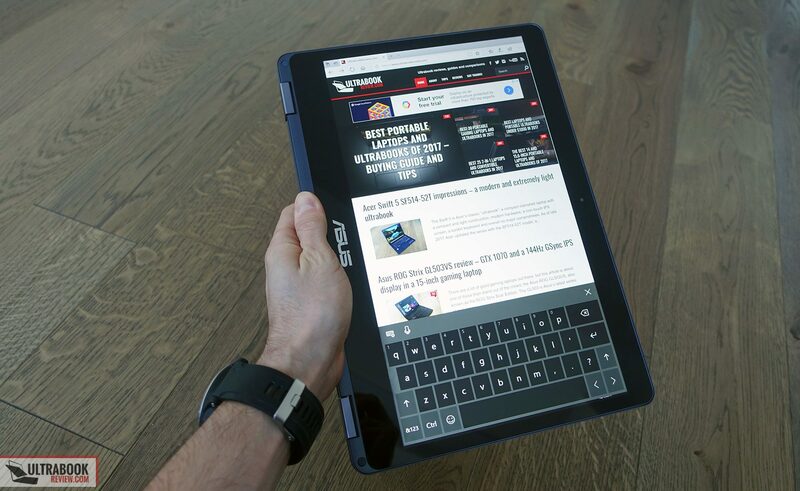 According to other Asus itself and Windows Central, the NovaGo does actually have a backlit keyboard, that was a huge downsid Edie me not to ge the NovaGo after I read this review, but I did a little more research, and I’m pretty sure it does, how did you know it didn’t have a backlit keyboard? No button for it? 7 weeks and no review… are you going through difficulties right now? Have you decided to abandon this project? Not sure what you were expecting, but I'm not going to post an actual review before the final release products will be available in late Q1. I can't find any information as to when the NovaGo will be available for order and where to order from. Do you have any information on that? Hard to believe that Andrei Girbea could have information that the major technology sites still don't have. Still, a Google search returned April 2018 as release date in Germany (for 700 euros), and in general spring 2018 for other parts of the world.